Warrington Wolves head coach Tony Smith has called for more protection for players after Matty Russell had to have his two front teeth removed. The full-back, 21, collided with Widnes forward Macgraff Leuluai in their play-off win over the Vikings on Saturday and needed oxygen on the pitch. 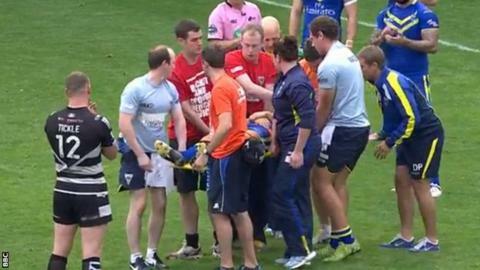 Scotland international Russell left the field on a stretcher in a neck brace, but was cleared of serious injury. "I don't think we're protecting our players," said Smith. "I don't want anybody to get into trouble...but I thought it was handled poorly on the day and I think it's been handed poorly ever since." "Despite whether they are dipping, despite their size, whether it's Rob Burrow or Trent Waterhouse, the onus has always been on the defender to not hit somebody in the face. "It was totally accidental, in terms of he didn't try to hit him in the head, absolutely. "But when you decide to make a tackle and the ball carrier dips, for whatever the reason, the onus has always been on the defender." Speaking to BBC Radio Merseyside, Smith continued: "It's going to be interesting to see how defences go here on in. "They'll go to every judiciary disciplinary meeting and say 'well the ball carrier was dipping'. "The onus still has to be on the defender to bend his back and not hit somebody in the head, that's what we're charged to do - to protect our players in our game. "I don't want anybody to get into trouble, and I'm not looking for any repercussions from what I'm saying, but I thought it was handled poorly on the day and I think it's been handed poorly ever since." Russell did suffer a concussion and a broken nose in the incident but played down Leuluai's intent on his Twitter account. Wolves battled back from 18-0 down to progress to a preliminary semi-final eliminator against Castleford on Thursday.